The Capitals were simply outplayed in this contest, and at times, were nearly run out of the building. As a result, the Caps suffered their second-consecutive decisive defeat. There were very few bright spots for the defending champs, and the numbers essentially point that out. The Capitals are back in action tomorrow night when they visit the Stars in Dallas. Puck drop is set for 8:00 PM ET. The Blues struck first just four minutes into the contest with a deflected goal, but the Caps would answer late in the period with Alex Ovechkin’s 30th goal of the season for a 1-1 tie at the first intermission. Brett Connolly would give the Caps a 2-1 lead with his ninth tally of the season, but the Blues would respond with a power play goal and add another tally late in the middle frame for a 3-2 lead at the second intermission. The Blues would make it 4-2 five minutes into the final frame and another tally with nine minutes remaining for a 5-2 win. The lack of offense from the Capitals top six (sans Ovechkin) and porous defense in front of their own goal for a second straight game were the big issues. Many were figuring Pheonix Copley would get the start against his former team in St. Louis, and that Braden Holtby would get the start tomorrow night in Dallas. Not so fast. Braden Holtby drew the start in this one. Matt Niskanen returned to the lineup for the first time since taking a wicked spill against the Hurricanes on December 27. Tom Wilson returned to the first line with Evgeny Kuznetsov and Alex Ovechkin. Scratches: Jonas Siegenthaler, Travis Boyd and Devante Smith-Pelly. The Capitals led in shot attempts 13-9 after 20 minutes. Washington was sluggish out of the gate, giving up the first goal, but rebounded later in the period, and tied the game 1-1 after 20 minutes of play. 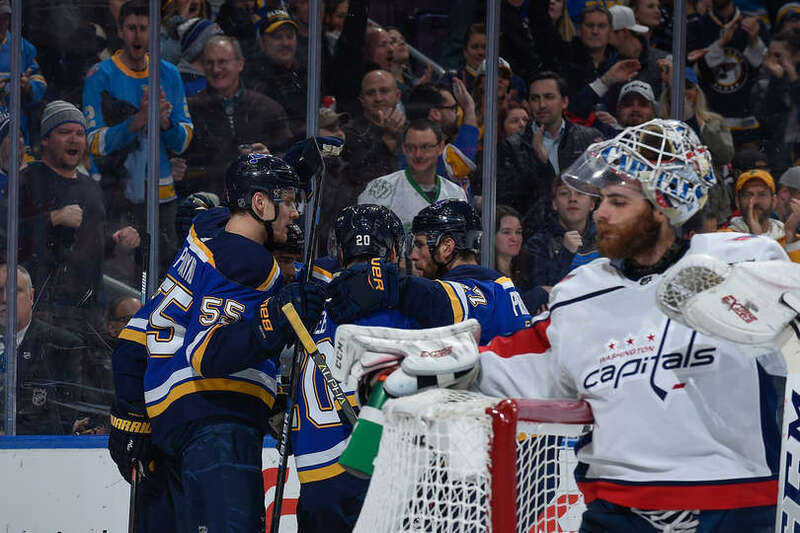 The Blues stepped on the pedal in the middle frame, out-attempting the Caps 21-8, led in shots on goal 19-10 and took a 3-2 lead. 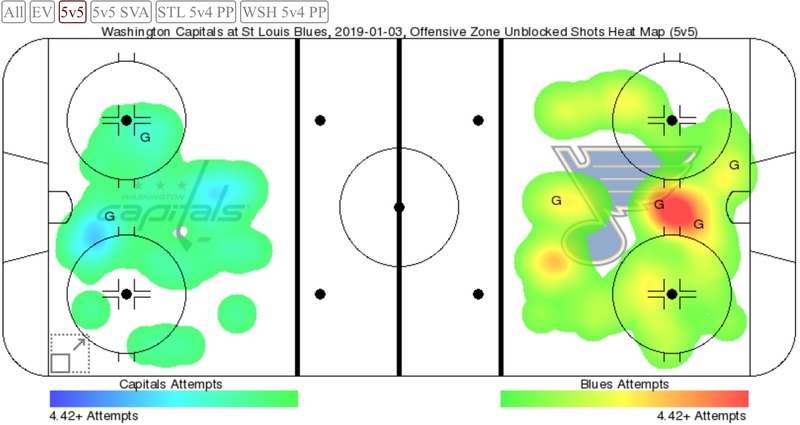 Wilson and Bortuzzo dropped the mits at the start of the period, and the scrap seemed to ignite the Blues and Enterprise Arena. The Blues would continue the thumping in the third period. They out-attempted the Caps 23-10 and led 14-2 in SOG in the final frame. 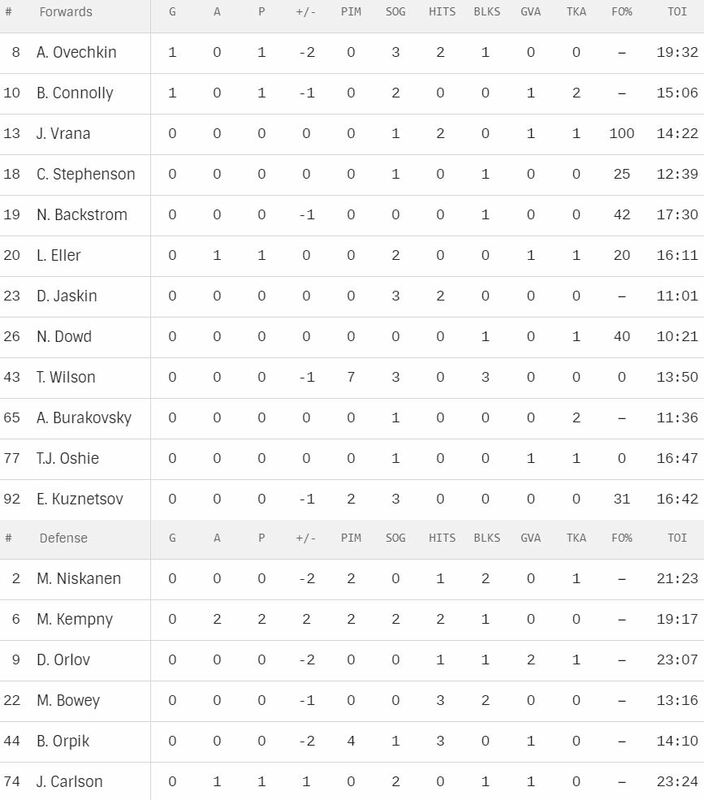 You can clearly see the turning points in the game by the possession stats in the chart below. The Wilson-Bortuzzo fight occurred near the start of the second period. Braden Holtby stopped 37 of 42 shots for a .881 save percentage. Jake Allen stopped 23 of 25 shots for a .920 save percentage. The Capitals power play has been blanked in six of the last seven games, and did no better in this one, going 0 for 3 in the contest. The Blues were 1 for 4 on the man advantage. The Blues dominated at the dot 68-32%. Jakub Vrana was 1 for 1, Chandler Stephenson was 1 for 4, Nicklas Backstrom was 5 for 12, Lars Eller was 2 for 10, Nic Dowd was 2 for 5, Tom Wilson was 0 for 1, T.J. Oshie was 0 for 1 and Evgeny Kuznetsov was 4 for 13. Alex Ovechkin is the second player in NHL history to score at least 30 goals in each of his first 14 seasons, joining longtime @Capitals forward Mike Gartner (15; 1979-80 to 1993-94). This entry was posted in News and tagged Alex Ovechkin, Brett Connolly, Inside The Numbers, Jon Sorensen, St. Louis Blues, Washington Capitals. Bookmark the permalink. When will Vrana ever get some decent power play time?